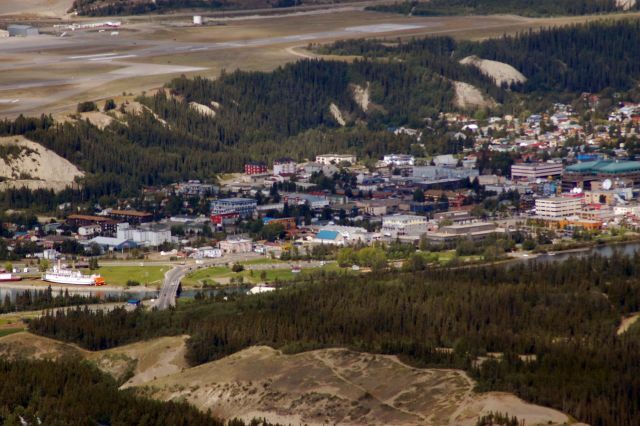 From the S.S. Klondike in Whitehorse, cross the bridge onto Lewes Blvd and make a left at the second set of lights onto Alsek Road. After 400 m, make a left at Tutshi Road (there is a sign indicating the cemetery and Grey Mountain viewpoint). 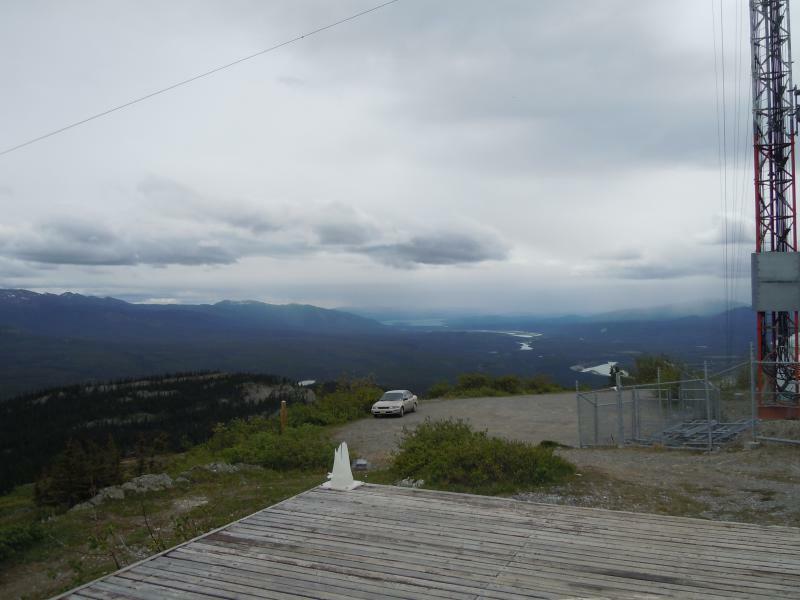 Follow the Grey Mountain Road to the Grey Mountain Viewpoint parking area at around 6.3 km. 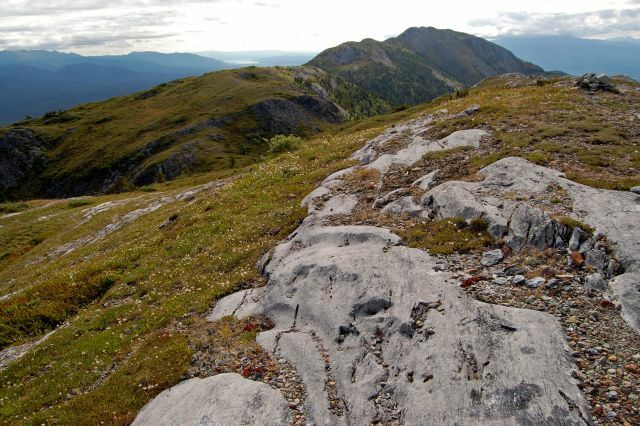 You can drive past this parking area for the remaining 4 km, but note the road becomes unmaintained and rougher with narrow sections towards the top. It is easily driveable in a vehicle with good clearance and some people even drive their cars all the way up. There is a good parking area right at the communication towers where the trails start. The trailhead starts near the parking lot and communication towers. 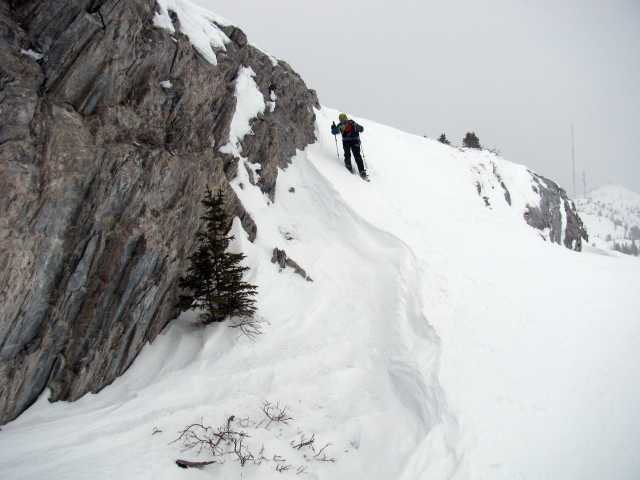 There are many trails along the ridge which end up at the same place - follow the most developed trail to prevent further erosion. 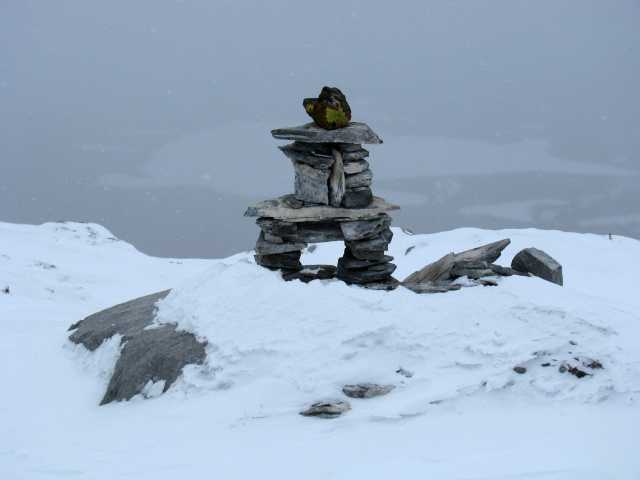 After 2.5 km you will reach the first summit and have a great view of the surrounding area. 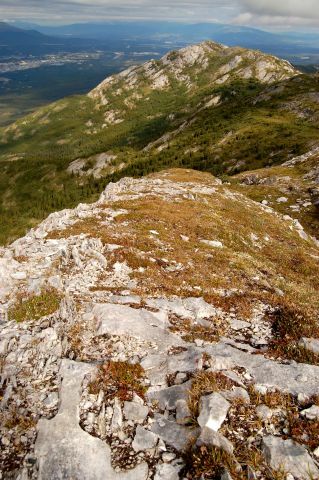 If you want to continue walking along the ridge, follow one of the main trails towards the second, lower peak. The trail can be faint at times. 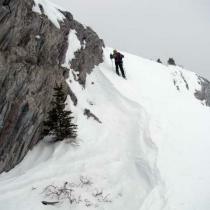 To continue on from the second peak to the third, you will have to descend out of the alpine. This requires some very moderate bushwacking to the other side where you will ascend towards the third peak. There isn't much of a trail at some points, so pick your own way if necessary. 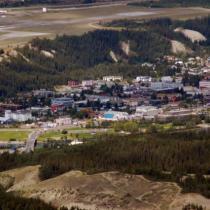 The third peak offers the best view of Whitehorse. From here, turn around and follow the same route back. 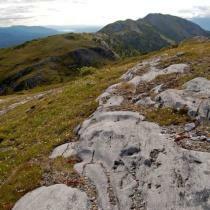 Although this hike is close to town, there is evidence of bear activity such as bear droppings and digging marks. Act as you would on any other backcountry trail, making noise at intervals so as not to surprise a bear when you climb over a crest. 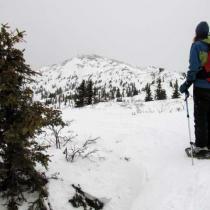 The top of Grey Mountain is excellent for a showshoeing or ski touring day trip. 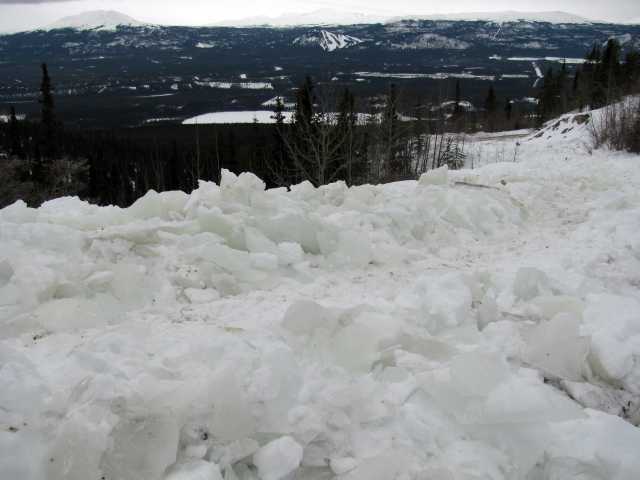 Note the unmaintained part of the road after the Grey Mountain Viewpoint parking area is not always passable in the winter and late into the spring. So plan for some extra time, about 1.5 hours one-way, to walk from the Viewpoint parking area to the communication towers. 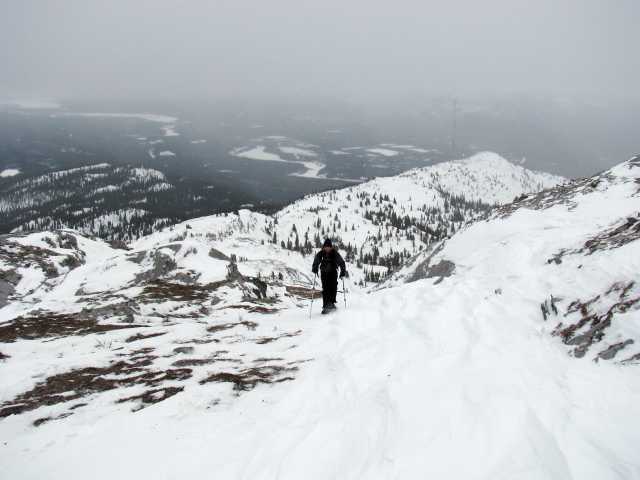 Have you been to Grey Mountain lately? Went Saturday April 13th. 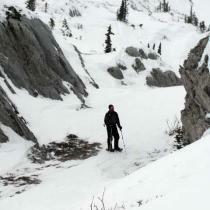 There's still some snow at some parts, but not much, so you don't need snowshoes or anything. 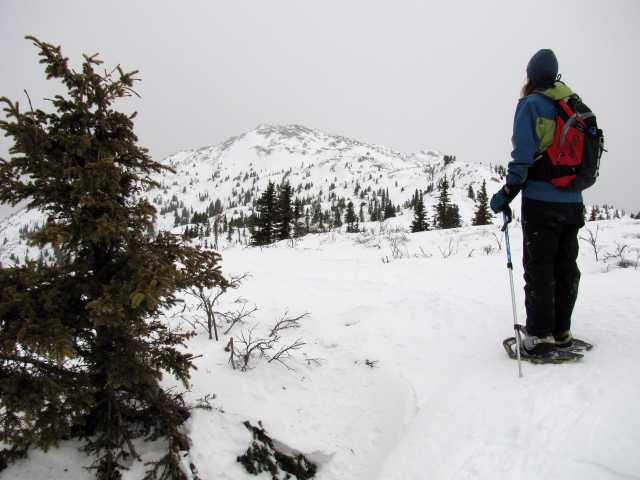 Just be sure you have good winter hiking boots. You tend to lose sight of the trail sometimes, because of the snow and the mud. However, pretty nice hike! The view is awesome and beautiful. Worth it. The unmaintained road was pretty dangerous. 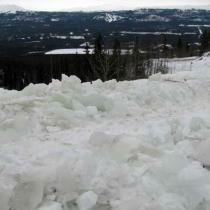 Even with a 4X4 pickup truck, we weren't able to get to the communication towers (too much ice). We stopped halfway on that sketchy road and walked to the trailhead. We went Oct. 20th. Didn't quite manage the drive to the radio tower, as we were not prepared for snow, and there was just a little; a small car passed us while we were walking to the trailhead, though! We didn't have winter footgear and brought a baby so opted not to do the trail but had some great views from the road walking up! Would love to do it properly. Tried to do this trail Aug 25 and didn't even make it to the communication tower. It's a 10km road that is SUPER sketchy and you definitely need an SUV or 4x4. We had a rental car and tried driving it but after 0.5km we turned around. We met someone coming back in a car and said we shouldn't even try it. She went halfway and turned around. Apparently the last bit is a super narrow steep hill. The road is full of potholes and it would take a long time to drive. 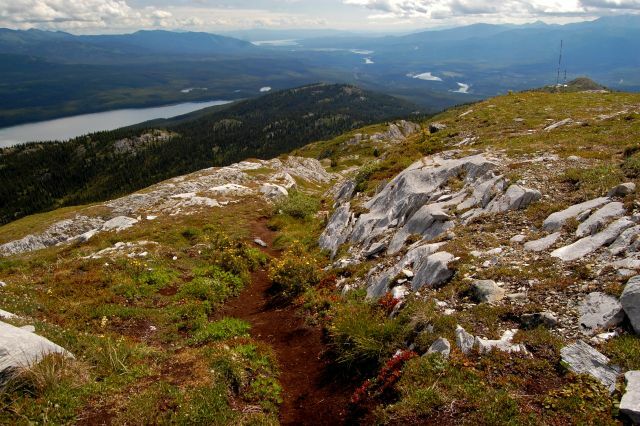 We ended up doing some other trails on Upper grey Mountain (B&S trail-mountain bike trail to Chadden lake). Lots of trails to choose from once you get up to the upper trails and it's fine in a car. 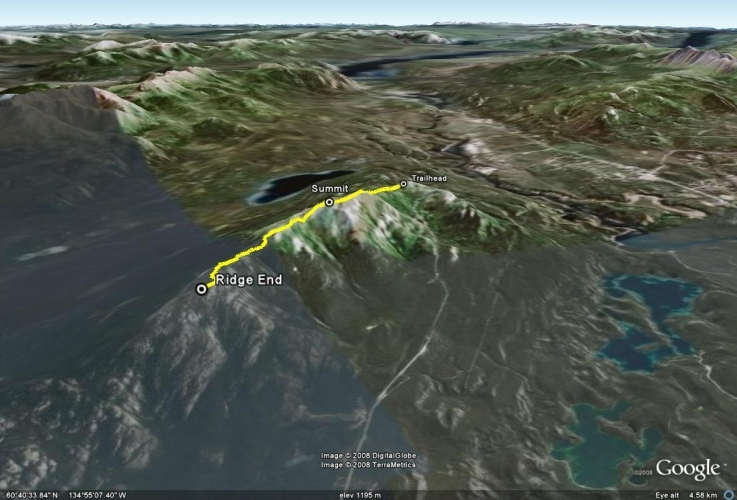 Ran this route on the evening of July 9th. Trail is dry and in great shape. 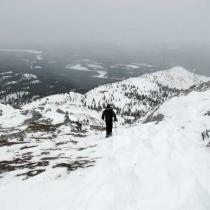 Pretty windy up top, should have brought another layer. Took two hours at a decent clip - almost all runnable if you're comfortable on uneven terrain. Top section of the road is in pretty rough shape, I was glad to have a truck. Did a 9.2km return trip from the car (parked part way up the mountain and walked to the tower). Lovely breezy day to keep down the sweat and biting insects. Saw a black bear on one of the ridges munching away on some plants (about 1/2 km away). Lovely day and always nice to bring visitors up there. 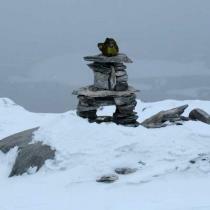 Lost last winter along the Grey Mtn trail, maybe 4-500 m from the heli pad, one White climbing skin. Snow flake pattern on it. It was hanging in the willows along the trail last week apparently, so if you found it give me a shout, I'm in the book. 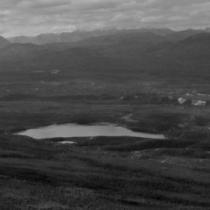 We went on Canada Day and it was great quick hike, took only a couple hours to go up to the summit and back. It was quite busy but an amazing way to spend Canada Day! Beautiful trail, BUT...this has obviously seen more usage in the past few years. As you close in on the summit, the earth is greatly disturbed. Paths intersecting everywhere. This is sensitive alpine vegetation that is being trampled. Please hike with care, and stay on the obvious paths! I drove up to the Antennas in a 1995 Toyota Corolla which certainly does not have any kind of road clearance at all. 98% of the road was fine in first gear. Just before the top I scraped the bottom of the car a bit - nothing severe. So it can be done, but you need to go slow over the bigger holes and protruding rocks near the top. 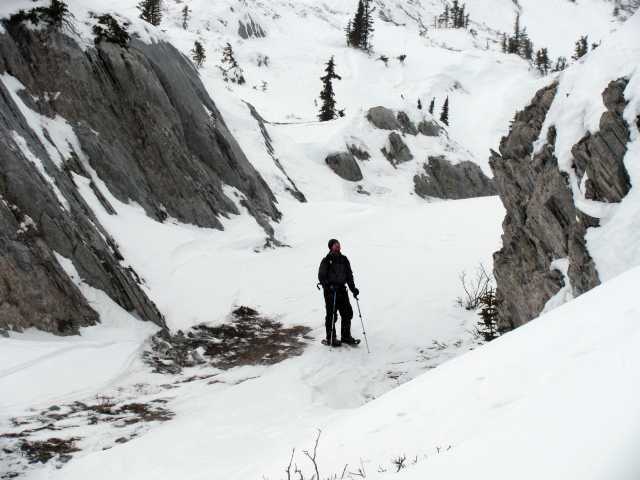 I would describe the hike from the first peak to the second peak as 'moderate' to difficult, depending on how much you are packing in and what speed you want to go at. It is a very doable hike. Its impossible to get lost. The view are tremendous. Did this hike today (May 26, 2013) and while the road is a bit rough, the only reason we didn't go all the way to the top in a 2002 base model cavalier was because of the snow that was still covering the road. It was absolutely phenomenal in terms of views, weather and complete lack of bugs. 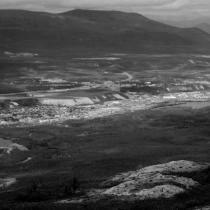 I haven't done anywhere near all the hikes Whitehorse has to offer but this will stay near the top for views and lack of ridiculous effort. Did this hike starting from the antennae. The drive up is a bit perilous, there are no railings at some spots and it's a long way down. If you're not comfortable with this kind of driving you may want to stop at one of the many parking areas located on the road leading up. 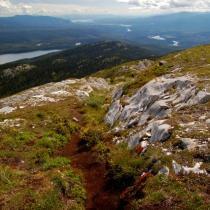 The hike itself is extremely rugged, at some places it is unclear as to where the trail even is. There is only one general direction to go, however, so getting lost is not an issue. 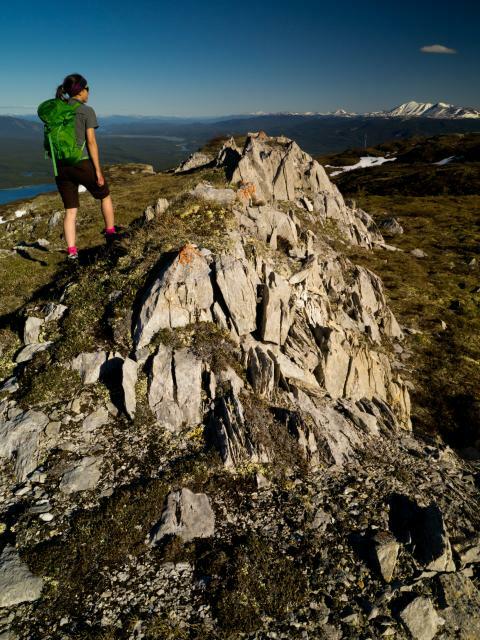 The ruggedness warrants a sturdy pair of (preferably waterproof) hiking boots, there are many jagged rocks and uneven surfaces, mixed with some spongy marshes created by meltwater. My friends did the hike in sneakers but their feet did get a little wet. The duration will most likely depend on how frequently you stop. 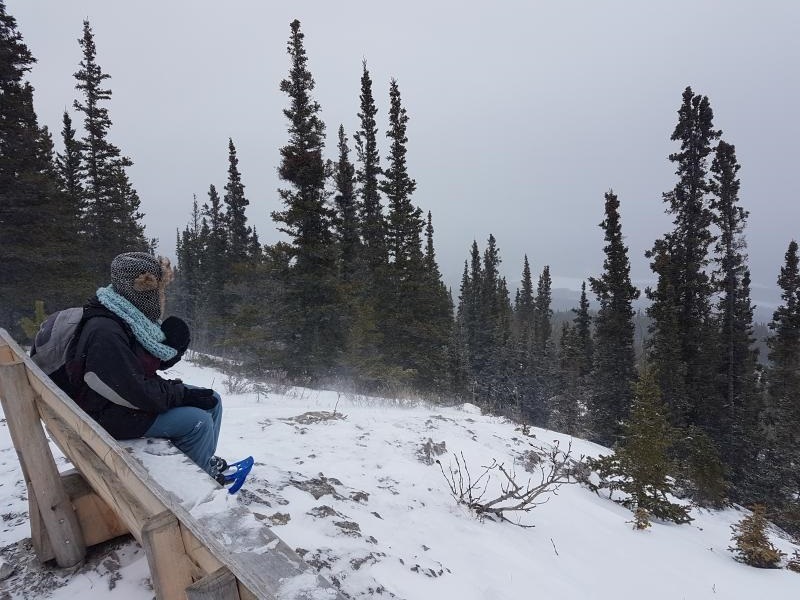 People with less hiking experience will probably want to take frequent rest stops, as there are some steep inclines, and the views are so magnificent that you might spend a lot of time taking pictures. We walked close to the ridge end and it took us a couple of hours or so. 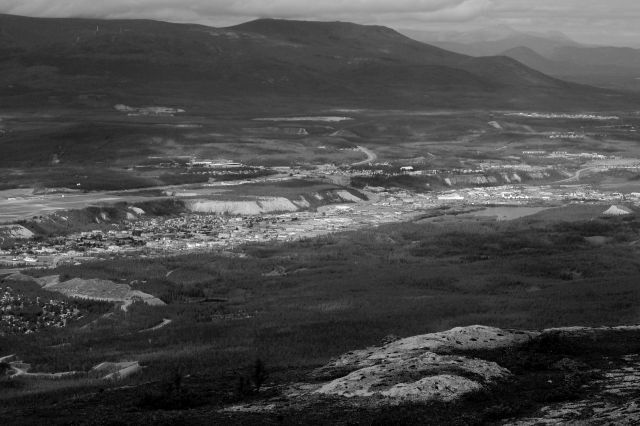 I highly recommend this hike, even if you are just passing through Whitehorse, as it is a very short drive from the city and won't take you any longer than an afternoon to complete. 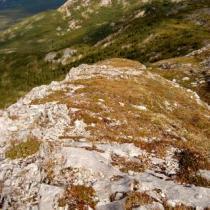 Included is a panoramic view from the summit. We were able to drive all the way to the communication towers today in a small, low clearance car. The ridge was mostly dry and the sun was out (18C this evening). 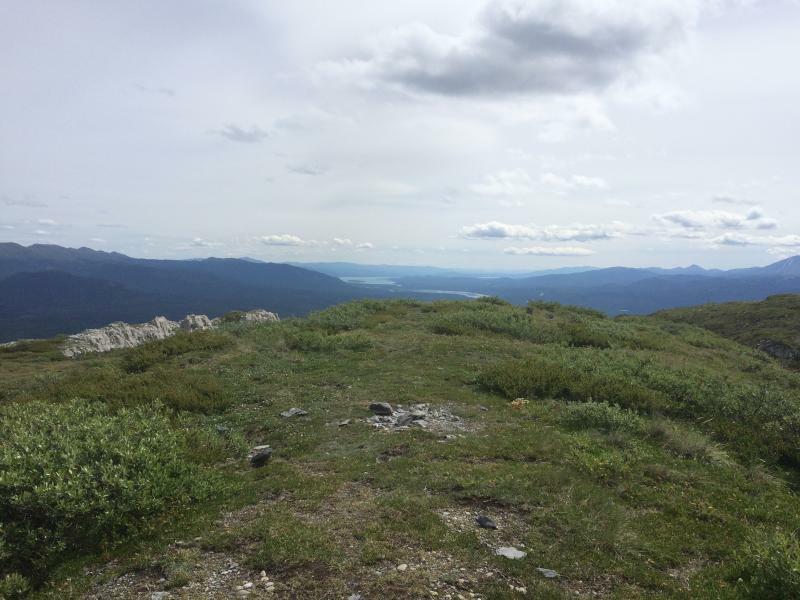 We walked to the first summit, which took roughly 45 minutes at a leisurely pace.